Not to be confused with Jamal Abdel Nasser Mosque in the West Bank. Gamal Abdel Nasser Mosque (Arabic: مسجد جمال عبد الناصر‎) is a mosque in Cairo. 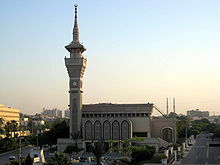 The mosque is known for containing the mausoleum of Gamal Abdel Nasser. It is located in El Qobbah district and as such, it is often referred to as "El-Qobbah Mosque". It is situated close to the building of the Ministry of Defence and Military Production, and the campus of Ain Shams University. Construction of the mosque begun in 1962, with the donation of the citizens of El Qobbah. In 1965, Nasser ordered the completion of the construction by financing the cost and supervising the design, which employs the modern Arabic architectural style. The construction cost reached 300,000 Egyptian pounds. Several social activities take place in the mosque, including the Qur'anic learning, training for orphan girls and medical clinic. ^ بتحب عبد الناصر؟.. طبعا.. زرت "الضريح"؟.. لسه .. يبقى مابتحبوش. Elwatan News. Retrieved January 11, 2018. ^ Masjid Jamal 'Abd al-Nasir. Archnet. Retrieved January 11, 2018. Wikimedia Commons has media related to Gamal Abdel Nasser Mosque, Cairo. This page was last edited on 2 April 2019, at 18:14 (UTC).